The partial government shutdown dragged into a 22nd day Friday, becoming the longest funding lapse in U.S. history. The closure of about a quarter of the government will last until at least Monday. Lawmakers and the White House have failed to break an impasse over President Donald Trump's demand for more than $5 billion to build his proposed border wall. Congress failed to break an impasse this week over President Donald Trump's demand for more than $5 billion to build his proposed border wall, even as 800,000 federal workers started to miss paychecks Friday. The closure of nine federal departments will last at least 24 days — and likely longer — as Congress does not convene again until Monday. Talks about reopening a quarter of the government fizzled out this week, amid Trump insistence on funding for a barrier that Democrats have repeatedly refused. The Democratic-held House has passed bills to temporarily fund the government, but the GOP-controlled Senate has refused to take them up amid the president's veto threat. The impasse could move to a more polarizing phase, as Trump has threatened to declare a national emergency to circumvent the legislature. Lawmakers and the White House appear far from forging an agreement to reopen the government. As the partial closure drags on, it is expected to cause economic damage due to missed paychecks, which may disrupt mortgage applications, food assistance programs and consumer sentiment. If the shutdown continues for two more weeks, its estimated damage to the economy of $6 billion will top the $5.7 billion Trump seeks for the wall, according to S&P Global Ratings. 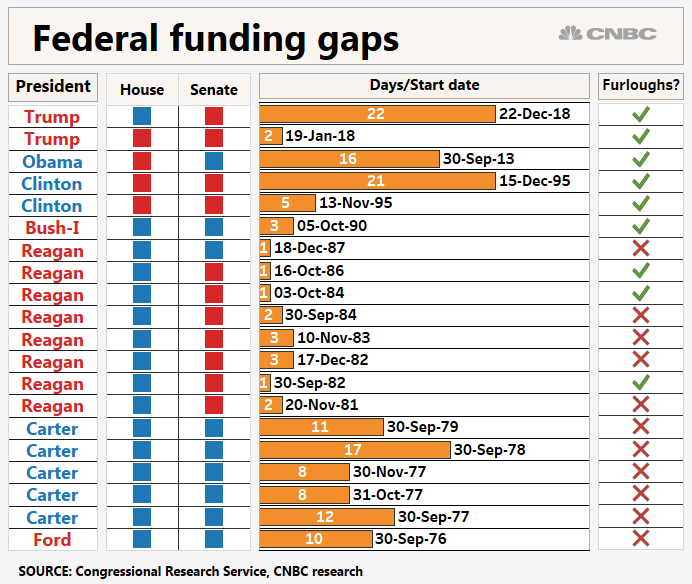 The current funding lapse tops the previous record of 21 days set in December 1995 and January 1996, caused by a budget standoff during the Clinton administration. The damage from the partial shutdown that started last month is expected to be more limited than some previous closures as it affects about one-fourth of the government. Congress passed a bill Friday guaranteeing back pay for federal workers — which Trump said he would sign. During other previous shutdowns, particularly in the 1970s, workers did not face furloughs.